As one of the only piano instructors in Tallahassee who welcomes working with very young students (starting at age 3), Mr. Garcia-Bolao uses Alfred’s Music for Little Mozarts for the younger beginner. This method is fun and moves at a slower pace, which allows the very gradual assimilation of material by the youngest of students. 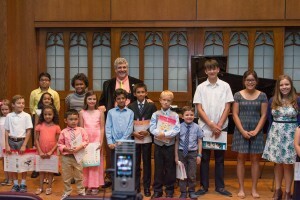 The Music for Little Mozarts Piano Course was written by Christine H. Barden, Gayle Kowalchyk and E. L. Lancaster specifically for the preschool age group (four-, five- and six-year-olds). This curriculum provides a balance between the discipline necessary for playing the piano and the enjoyment one receives from the process of music making. The course centers on the adventures of Beethoven Bear and Mozart Mouse™ as they learn about music. Three correlating books (Music Lesson Book, Music Workbook and Music Discovery Book) at each of four levels guide the children through a comprehensive approach to musical learning, using the piano, over approximately a two-year period. For the more mature members of this age group, Mr Garcia-Bolao favors My First Piano Adventure for the Young Beginner. Written for ages 5 and 6, My First Piano Adventure® captures the child’s playful spirit. Fun-filled songs, rhythm games and technique activities develop beginning keyboard skills. Lessons for this age group are almost invariably 30-minutes long. Very early on, students are ready to perform in group classes and recitals.